Этот редактор является идеальным средством для редактирования HTML, PHP, JSP и XML файлов. При указании интернет-браузера в качестве внешнего приложения, вы сможете просматривать HTML файлы во время редактирования. Fixed the bug where the template contents could be inserted on editing a snippet if you specify a template for the Text configuration. Fixed the bug where UTF-8 auto-detect may not have worked when opening a very large file. Fixed the bug where only a portion of very large file could be searched when trying to use Find in Files feature with a very large file. Fixed the bug where clicking the "Find Up" did not count matches on a certain condition. Fixed the bug where the cursor did not move to start/end of document when "Additional Lines to Search for Regular Expressions" was not 0. Added Korean, Simplified Chinese and Traditional Chinese user interfaces. 1.Установить программу (x86 или x64,в зависимости от вашей системы),не запускать её. 2.Скопировать emeditor.10.0.4.32-64-patch.exe в корневую папку программы (C:\Program Files\EmEditor),запустить,нажать Patch,появится файлик EmEditor.exe.BAK. 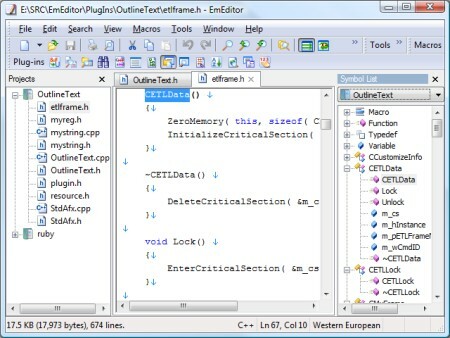 EmEditor Text Editor is a lightweight, yet extendable, easy-to-use text editor for Windows. EmEditor is very customizable, and it supports Unicode and powerful macros. EmEditor now supports very large files - up to 248 GB or 2.1 billion lines! EmEditor is certified for Windows Vista! The new version optimizes the speed to open a huge file, so it can open a huge file much more quickly than previous versions. The new multithreaded design allows you to view documents during the opening of a file. The Project plug-in now automatically displays the symbol list in another custom bar. The plug-in uses Ctags to create tags, and reads the tags to display the symbol list. All you need to do is to add your files to a project! The new version also optimizes for Find and Replace speed (2 - 8 times faster! ), and supports RHTML files (used in Ruby on Rails)!